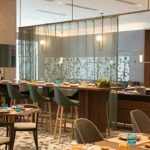 The Sukhothai Shanghai, a contemporary lifestyle hotel located at HKRI Taikoo Hui, launches five vibrant and eclectic restaurants and bars with unique themes and settings to deliver enriching dining experiences to both locals and visitors alike. Led by Executive Chef Marcus Ng from Malaysia, all-day restaurant URBAN Café is a lively and buzzing venue serving authentic Southeast Asian fare. 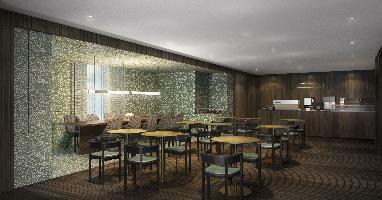 The design boasts sleek and natural elements, created by the exquisite green leaf-patterned tiles and terrazzo walls. Urban Asian artwork prominently displayed across the restaurant, as well as the custom furnishings perfectly complete the visual concept. The sharing menu is created for groups, big and small to enjoy together, with intimate table setting displaying the essence of Asian dining culture. The culinary team maintains the fresh flavours of authentic Southeast Asian cuisine through premium seafood, meat and seasonal vegetables. Dishes such as wagyu beef rendang, Malaysia style sauna prawns and scallops with thai dressing, seafood laksa noodle and Vietnamese style scotch egg with nuoc cham dipping are all signature classics not to be missed. Featuring cool, clean-cut lines and minimal furnishings to exude timeless elegance, URBAN Lounge provides a relaxing setting to enjoy an afternoon tea, or for quick gatherings and casual business meetings. 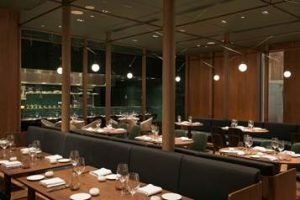 The 12-metre teakwood bar spanning across the lounge is the highlight of the restaurant, with natural walnut wood, glowing bronze and textured stones all add to the ambience, finished by abstract paintings to give a warm atmosphere. URBAN Lounge stocks a gallery of over 100 premium gins and tonics to take the enjoyment of this classic highball to new heights. Guests may explore different flavour profiles, choose from a handpicked selection of garnishes to harmonise, contrast and balance with the gin’s key flavours. The chill, relaxing vibes are set by an expertly-curated playlist of live jazz music. The signature herb trolley is a wellness alternative, featuring 29 specialty tea blends and over 18 organic herbs house-grown in hydroponic planter boxes to ensure supreme freshness. Guests may create their own concoction by choosing the herbs for freshly-infused drinks. a variety of dippers, followed by 12 mouth-watering desserts that include all five tastes, with a Very Vodka Cocoa cocktail to perfectly conclude the experience. The famous Italian restaurant hailing from the sister hotel in Bangkok, La Scala is led by Michelin-starred guest chef Theodor Falser and chef de cuisine Stefano Sanna, who put their own stamp on the restaurant concept, crafting creative Italian cuisine that prizes authenticity, refined quality and sustainability. The delightful gastronomic experience at La Scala is about discovery – through the wholesome ingredients in the purest form, thoughtful flavour pairing that brings palate-pleasing sensation and unexpected twist to traditional recipes, inventive ways of cooking stem-to-root and nose-to-tail, and artful presentation that accentuates the restaurant’s culinary philosophy. A master-and-disciple team, chefs Theodor and Stefano have meticulously devised a menu inspired by the pristine nature, shining light on recipes that call attention to low carbon footprint, local and sustainable sourcing, low waste, and zero frozen and processed ingredients, paying homage to food, land and its people. Inspired by the Italian Renaissance garden, the restaurant showcases the classical notions through the use of hand-glazed ceramic tiles, teakwood parquet flooring and hanging lights framed by gridded wood columns, calling for a sense of contemporary sophistication. The chef’s table in the open kitchen is the focal point of the restaurant, where diners can enjoy the chefs’ performance and flair. marinated in pesto, served with house-smoked potatoes and sweet honey-glazed beetroots, resulting in an intriguing mix of sweet, creamy and earthy aromas. Designed as a casual gathering place and a haven for cocktail connoisseurs, The ZUK Bar is a bistro by day with vibrant energy, and a lively bar with upbeat atmosphere as night falls. Stylish and inviting, the quintessential downtown gathering place serving simple modern Nordic cuisine and artisanal cocktails by resident master mixologist Vincenzo Pagliara. Accessible from street level with an outdoor terrace set up for alfresco dining and relaxing evenings with a view, this boutique bar is defined by white and green leaf-patterned wall tiles, custom-made white and walnut-coloured furnishings and bespoke mood lighting. 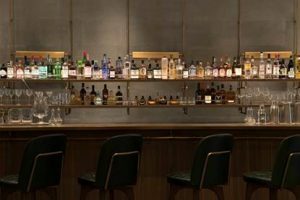 The intimate rectangular brass-plated bar and surrounding high stools allow guests to catch a glimpse of the art of mixology from our bar experts. Head of Mixology, Vincenzo Pagliara joins from one of the best bars in London, curating bespoke artisanal cocktails with intriguing elixirs house-made with a laboratory-type rotary evaporator (rotovap) to bring exciting creations to guests. The nature-inspired drink menu is based on four key elements – Oaks, Rocks, Flora and Water – with Pagliara’s sophisticated technique and creativity, to enhance the gastronomic scene in Shanghai by creating innovative cocktails with stunning presentation and unique flavours. The ZUK Bar also offers Nordic light meals featuring local and fresh prime products to create a balanced meal for fish lovers and food enthusiasts who are keen to substitute their day meal with more nutritional options. ‘Beans’ represent the deep aroma of coffee beans roasting in the day, while ‘Grapes’ represent the true base of a glass of wine and both create the spirits of great community or gathering after a long day of work. The interior is crafted with dark brown teakwood and terrazzo, exuding a clean, refreshing aura. Feature lightings and custom-made furniture add a sense of warmth to the setting. Casual and modern, Beans & Grapes serves wholesome comfort meals and refreshments during the day, perfect for a quick morning coffee en route to work, grab-and-go lunch, a relaxing hangout, informal business meeting or enjoying a book or two. At sundown, the space is transformed into a more upbeat atmosphere, offering a selection of Asian inspired tapas and global wines by the glass. All items on the Beans & Grapes menu are freshly-prepared in our kitchens and available all day, including home-baked breads, healthy and wholesome sandwiches, freshly-squeezed and blended juices, plant-based salads-in-the-jar with a twist of Mediterranean and Asian flavours, and delicious cakes. The highlights of Beans & Grapes are our signature pies, Asian or Western favourites that come with a variety of savoury and sweet fillings, such assatay chicken fillo pie, shepherd’s pie, pumpkin pie, and sweet potato and pecan pie. Located in the shopping and tourist hotspot of West Nanjing Road and Shimen Yi Road, The Sukhothai Shanghai is a contemporary lifestyle hotel that forms an integral part of the HKRI Taikoo Hui mixed-use complex, which also includes Grade-A office towers and a premium shopping mall. A member of Small Luxury Hotels of the World, the hotel is an inspired work of design by the internationally-acclaimed Neri&Hu Design and Research Office, featuring 170 well-appointed guest rooms and 31 suites ranging from 44 to 172 square metres, five inspiring lifestyle dining venues, a state-of-the-art fitness studio complete with a 25-metre heated indoor pool, and The Retreat spa specialising in revitalising wellness programmes. Upholding our goal to deliver experiential hospitality, The Sukhothai Shanghai strives to offer personable services and unforgettable experiences to guests visiting the bustling metropolis.